Mark “Stan” Staniszewski’s passion for martial arts began over 3 decades ago as a young boy growing up on Long Island, NY. Years later, Stan discovered Judo and Brazilian Jiu Jitsu. Stan excelled in both, and has dedicated his life to studying, competing, and teaching the two disciplines. Stan has medaled in multiple state, national and world competitions and is the first dual black belt on Long Island in both Judo and BJJ. He was deservedly inducted into the Martial Arts Hall of Fame in 2010. Stan’s accolades in Judo and BJJ seem endless; however, his greatest accomplishments are his two sons, Luke and Jake. A month ago, Stan’s youngest son, Jake, was diagnosed with a rare form of pediatric cancer. Jake was diagnosed with advanced stage 4 Alveolar Rhabdomyosarcoma at only 15 months old. Rhabdomyosarcoma is a type of cancer that develops in the connective tissue, skeletal muscle or bone. The news shocked and devastated the Staniszewski family, but Jake is a fighter, just like his father. Members of the family quickly set up a donation page to help defray the steep costs of Jake’s treatment. In addition, Stan’s extended family, those in the Judo and BJJ community, set into action to support their friend in his time of need. Upon hearing the news about Jake, Michael Hall, friend and colleague of Stan’s as well as president of the American Competitive Judo Association (Americomp Judo), reached out to his friends for help. Nick Kossor, an international Judo competitor and US National Champion offered to donate his own money to the cause. However, Hall believes that the martial arts community could do more. 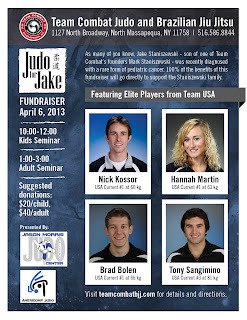 Hall organized Judo for Jake, a benefit seminar with all proceeds going directly to the Staniszewski family. The Saturday April 6th event will be open to both children and adults and will be held at Stan’s martial arts academy, Team Combat Judo and BJJ in Massapequa, NY. Participants will have the unique opportunity to learn from some the nation’s top ranked Judo players. 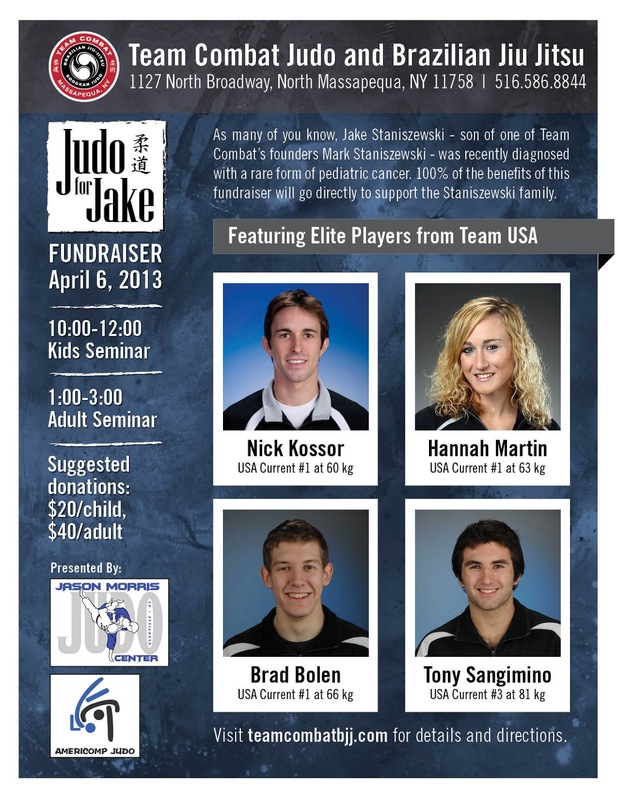 The seminar will be taught by 2016 Olympic hopefuls Tony Sangimino, Hannah Martin, Nick Kossor, and Brad Bolen. All skill levels are encouraged to come. These four Judokas have been training with Jason Morris at the Jason Morris Judo Center in Glenville, NY for nearly a decade. Morris, the four time Olympian, is considered to be one of the top Judo coaches in the country. “With Morris Judo goes beyond training. It is a culture and way of life.” stated Hall. The four athletes have one goal in sight, to bring home medals in the 2016 Olympic Games in Rio de Janeiro, Brazil. To accomplish that, the next 3 ½ years will consist of travelling around the world competing in world cups, grand slams, and world championships. Unlike other countries this travel is all self- funded. By attending the Judo for Jake seminar or by making a donation, members of the martial arts community have the opportunity to give back to a man who has given so much to the world of Judo and BJJ. More importantly, with this support, Jake Staniszewski becomes one step closer towards winning his fight against this awful disease.